In the last couple of weeks, I’ve read a lot of poorly or insufficiently reviewed content. Of course, given the deadlines and negative attitude of SMEs towards the written content, reviews aren’t always possible. But, when customers have no time to read your documentation, or prefer experimentation over reading the boring stuff, what should we do to make our content effective? In one of my previous posts where I’ve talked about the importance of minimalism in technical communication, we’ve seen how important it is to check and recheck any content before it is released. But, interestingly, it isn’t how most organizations handle their content. Result? A lot of redundancy and rework! But, what and why is this redundancy? And, how do we avoid it? Let us discuss these questions. What the hell is redundancy? Figure 1. Recurring redundancy is like repetitive repetition. Alternatively, use exclusive thoughts per sentence. Apparently, had I written or edited this piece of information, my version could have looked like, “Now, ABC offers the capability to substitute existing sub-assembly items. For a range of BOMs, use the Material Substitution for BOMs window to locate and replace the sub-assembly items with the corresponding item keys.” And, this version should be in the light of ignoring the writing mistakes the writer has committed. I recall an example in the same context. In the recent edit work, I read the following line in one of the released user manuals: “Press Back, to go back to the previous menu.” Now, of course, I do not blame anyone for this mistake (I too am not perfect), but it is obvious that by pressing the Back button, one goes BACK to the PREVIOUS screen. Therefore, you do not need to repeat the message. Figure 2. Same message, but different paragraphs. As a customer, I seek a small, but crisp piece of information, which does not take too long to read and comprehend. Though, this might seem a big demand, because it comes from a technical communicator in the background, we must not forget that today’s customer is busy, restless, and has a lot of free (cheaper) resources available. Figure 3. Save those words for the poor creative writers. I use a technique to avoid writing such sentences. My ex-boss taught it to me. Whenever I create content, I print and read it. The method has helped me [greatly] improve the quality of the content I create. That brings me to the next point in our discussion. How to avoid or resolve redundancy? Keep it Simple. It’s simple – Write professionally. Notice that I’ve used a set of em dashes to separate a fragment, which belongs to a sentence, but contains only optional information. Such a writing style is fine in informal documents (something like a blog), but not in technical, customer-facing documents. Save the creative-writing part for the marketing team. Peer Reviews. This process is – albeit way more effective than self-reviews – time consuming. Also, your peers, who are already loaded with their respective tasks, will be too occupied at times to check and correct mistakes. So, you will have to pass on the required information from time-to-time to help them correctly edit your documents. Role Plays. Now, this one is a bit difficult. For one of the projects, this year, we adopted this approach to check for gaps in our documents. We randomly distributed documents within our team, and used those to install, configure, and run our products, while noting the issues that surfaced. I call it review and role play testing. It has helped us remove the gaps in our documents. Self-Reviews. Make sure you design your own methodology to handle the documents on your plate. I keep switching my approach. When I have time, I do 80% of my work in the first half of the schedule, and devote the remaining time for concurrent reviews, while I keep adding the remaining 20% information. Also, I review my documents at least three times, cover-to-cover. Again, this is easier for me, because my organization follows document-level ownership. You may have a self-review method of your own. Another good way to exercise self-review, is to read (and edit) the content in the first half of the day. It helps surface some common, avoidable mistakes. Also, as I mentioned previously, use the “print-out” method to conduct self-reviews. Believe me, the content looks different on a paper. The Last-Minute List. Have your team work on a list of quick checkpoints for a last-minute review. Just as I mentioned in the beginning, running an edit cycle isn’t always possible. And, this is where the last-minute checklist comes in handy. My last-minute checklist is largely a subset of the documentation standards that help ensure consistency in my documents. Removing redundancy does not only mean removing repetitive sentences, words, or messages. It also means making your messages shorter, yet effective. The documents that serve needless information to the needy users are, after all, “boring.” And, the funny part is, you will find a lot of redundancy in your content when you revisited it after a few months. What about you? I’ll be happy to see your respond. The [mobile software] is fully integrated with [software] to ensure comprehensive inventory management. Your [mobile software] operates based on the information extracted from [software 2]. Managing inventories in large-scale companies is a big task. 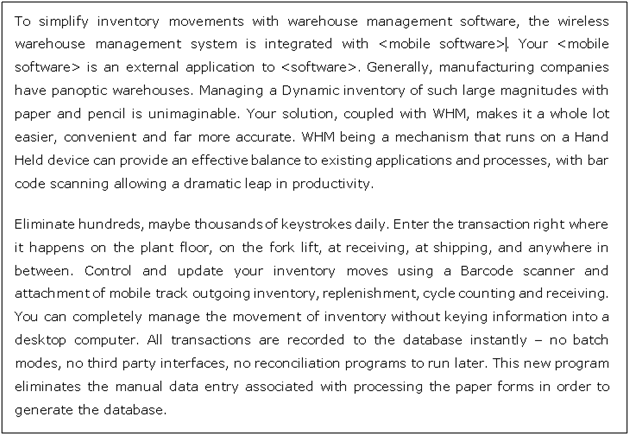 However, managing inventories using [mobile software] is a lot more convenient. You can scan bar codes, create transactions using easy drop-down menus, and track inventories using handheld devices. The transactions are recorded and updated real time, which helps keep records reconciled. This helps in accurate, easy, and quick management of everyday tasks like inventory management, replenishment, cycle counting, and batch receiving.